By Gabrielle. Photography and assistance by Gina Vide of Willowday. My girls have worn their hair long — shoulder length or longer — for years now. It wasn’t always so, and I’m sure it won’t always be so. But for now, like many families, we keep a generous stash of hair bands in our bathroom drawer ready to secure hair into ponytails, braids, and buns as needed. So when my friend Gina from Sweden sent me a photo of wooden bead hair ties she’d made, I had to get in on the action too! They work just like a standard rubberband — you put them on with a typical figure 8 twist, then adjust them so the beads are on top. The beads are such simple accent, but they add loads of charming personality! Of course, they remind me of the hair bobbles of my childhood — with colorful plastic balls at the ends. But these are much gentler on your hair and more modern looking. Plus, you can make them in any color you like! I think a small box with 3 or 4 of these would make such a sweet gift. You could create them in springtime colors and include them in an Easter basket. Or they would be wonderful to make a birthday party — a happy little activity that guests can make and use right away. I’m just crazy about the contrast of the glittery band or colorful shiny elastic against raw wood. If you prefer a glossier look, you could paint the beads to match or compliment the elastics. The combinations are endless. These hair twists are easy to make; fun to make alone or with friends on a craft night! A special touch for the girls in your house — and for yourself as well. Let’s start making! – 5/8″ fold over elastic (you can do a search for folded elastic to find tons of sources, Sunshine Shoppe is where the elastic pictured came from. Measure and cut one 12 inch piece of fold-over elastic. (Optional: Once cut, seal the ends by singeing their edges over a candle.) Choose 2 wood beads. These beads can be raw wood or painted with hobby paint, if desired. Carefully thread the elastic through the bead and pull close to the end. It’s helpful to coax the elastic through the bead by pushing it through with a wooden skewer. Tie a knot about 1 inch in from the end. Repeat this same threading and knotting of the elastic band on the opposite end. 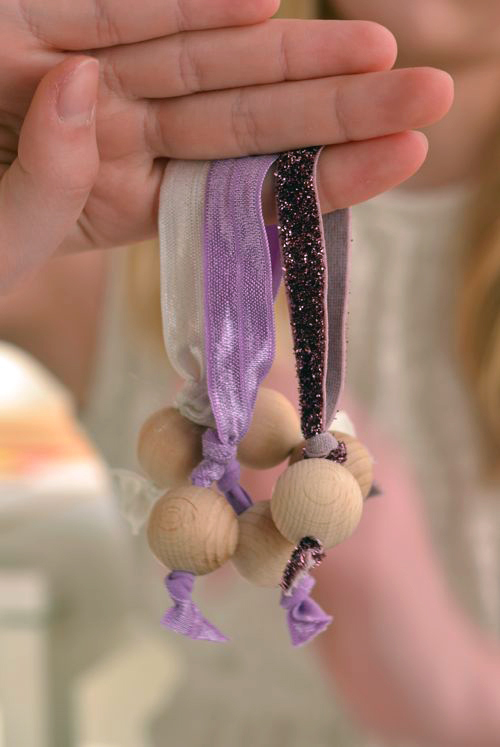 … then gather the beads and knot the band together as close to the beads as possible. 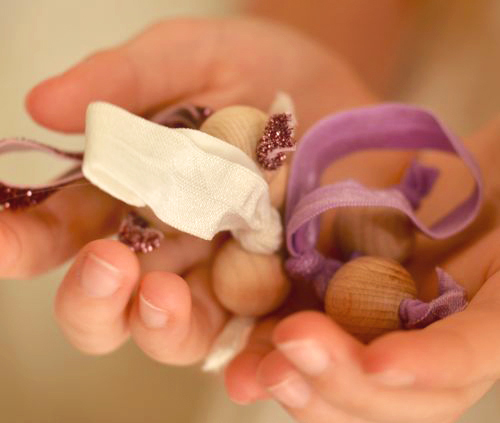 Once the elastics have been knotted, your beaded hair ties are ready for wearing and giving! These hair twists are worn like traditional hair bands. Start by fitting the elastic around pony tail, keeping the beads on the outside. 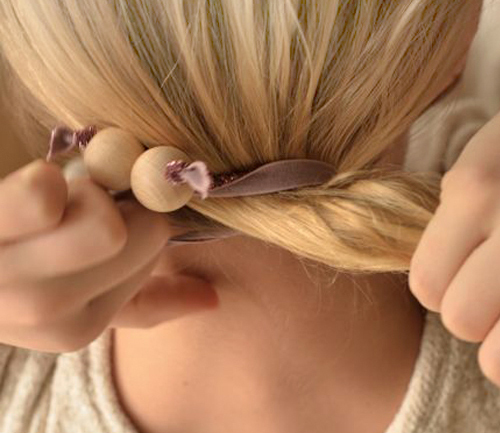 Twist the elastic into a figure 8 and draw the second loop up and over the pony tail. Adjust the double elastics that are now holding the pony tail into place so that the elastic is flat and so that the beads are on top. – A birthday party/slumber party activity. P.S. — Like to make gifts? Here are more ideas from our Perfect Gift series. Easy and so cute, I have to make these hair twists! Lovely idea! I can’t wait to try it. do you know of a good online source for this elastic? I was going to ask the very same question! There are lots of great sources for folded elastic (that’s the term I use when searching for this material). Here’s a good one: Sunshine Shoppe. This is so cool, pretty and easy enough for me to make. I have few girls in mind. Thank you. I love how these look!! Ooo! I can see making these for so many holidays. And birthdays! Fun and easy. Perfect combo. I can just imagine your girls making and wearing these with style! We’re addicted. There IS something about the shine and the glitter that makes these so special. I’m just so thrilled for the exchange! Happy Making and thanks so much for spreading creativity and beauty! These are so cute. These really would be cute as a gift too! Nice! Where is her outfit from? So cute and comfy! Love how this looks!. We have plenty of Liberty fabric pieces everywhere, good idea about how to re-use them. Congrats! I just bought a bunch of different colored foldover elastics at Joanne’s Fabrics to use as hairbands and have bits leftover from each color. This tute is perfect to make these leftovers into cute gifts.